Vote for your favorite image for this month! Welcome to the March 2015 Cloudy Nights Imaging/Sketching Contest poll! Each month the best images selected from the individual Cloudy Nights Imaging and Sketching forums will be presented for the user base to vote on. The winning entry will be posted on the front page of the CN website for all to admire! At the conclusion of the poll, the entry with the highest total will be the winner of the contest. Since only two entries qualified for the finals this month and they were in the same forum, instead f just having a run off in that forum I will place them both here for a general vote. Please choose your favorite from the entries below. The poll will remain open until April 2nd. Here are the entries for March! 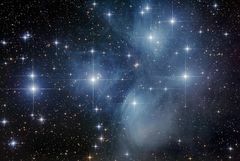 Since I just bought a new Subaru in January, I figured I would shoot M45. Taken over 3 nights in mid-February. 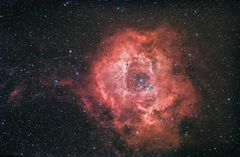 Here is a picture of the Rosette Nebula taken over 3 nights this month (luckily, the whole week was clear). This picture is a combination of RGB and Ha data. Well, for the first time that I am aware of we have a tie in the voting. I am discussing how to approach this, and will have an answer soon. Problems polar aligning my Orion Atlas Pro Az/Eq mount.